Chateau de Candale has been an estate in St. Emilion for centuries. The estate takes its name from the original founder of the property, Lady Margaret de Suddolk Kandall. The name was eventually shortened, and a phonetic spelling was chosen. Still, it is nice to be remembered. The modern era for Chateau de Candale begins for the estate when the vineyard was purchased by Jean Louis Vicard in 2010 from the Adams family. Stephen Adams and Denise Adams still own the neighboring Saint Emilion estate, Chateau Fonplegade. Jean Louis Vicard was already familiar with the Bordeaux wine trade as he was one of the more successful coopers, producing barrels in the Cognac region at his family company, Cooperage Vicard, that was founded all the way back in 1875. One of the first decisions made by Jean Louis Vicard was to bring in the team of Stephane Derenoncourt to consult on the wine making and vineyard management for Chateau de Candale. Since the estate was first purchased, Jean Louis Vicard has increased the size of the estate from 11 hectares to its current 13 hectare size. 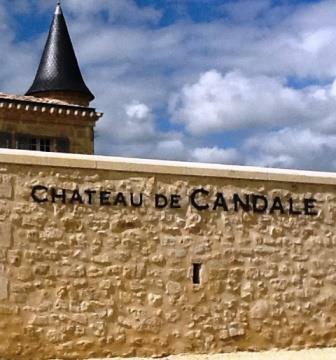 In January, 2017, Chateau de Candale was purchased by Thibaut Decoster and Magali Decoster who also own and manage 2 additional Bordeaux vineyards in Saint Emilion, Clos des Jacobins and Chateau La Commanderie. The Right Bank vineyard is planted to 84% Merlot, 14% Cabernet Franc and 2% Cabernet Sauvignon. The vineyard is located east of the Saint Emilion village, not too far from Tertre Roteboeuf. The terroir is clay and limestone soils and can be divided into 32 separate parcels. The vineyard is planted to a vine density of 6,000 vines per hectare. On average, the vines are kept at 30 years of age. Vineyard farming practices are self sustaining. To produce the wine of Chateau de Candale, the whole berry grapes are vinified in open top, conical shaped wood vats. Malolactic fermentation takes place in stainless steel tanks. The wine is aged in an average of 40% new, French oak barrels for between 12 to 18 months before bottling. As you might expect, the barrels were made by the owner, Jean Louis Vicard. There is a second wine, Roc de Candale. On average, the production is close to 4,200 case of wine per year of Chateau de Candale. Chateau Candale is usually better with 3-4 years of bottle age. Of course that can vary slightly, depending on the vintage. Chateau Candale is best enjoyed in the first 3-12 years of life. Young vintages can be decanted for up to 1 hour or so. This allows the wine to soften and open its perfume. Older vintages might need very little decanting, just enough to remove the sediment. Chateau de Candale is best served at 15.5 degrees Celsius, 60 degrees Fahrenheit. The cool, almost cellar temperature gives the wine more freshness and lift. Chateau de Candale is best paired with all types of classic meat dishes, veal, pork, beef, lamb, duck, game, roast chicken, roasted, braised and grilled dishes. Chateau Candale is also good when matched with with Asian dishes, rich fish courses like tuna, mushrooms and pasta. Aside from making wine, Chateau de Candale has earned a good reputation with local residents for their restaurant, L’Atelier de Candale, which offers a charming outdoor, wine country setting in Bordeaux. Black cherry, earth, licorice and flower aromas pique your interest in this medium bodied, early drinking wine. Prepare for an blitz of sweet cherry on the palate and in the finish. Refined elegance with juicy ripe plum, licorice, black cherry and smoke, this medium/full-bodied wine has soft, polished tannins and a fine, fruity finish. A forward and dapper charmer with supple textures, soft, round and fruity with a nice blast of licorice, black cherry and espresso in the finish. Forward, soft, round and fruity, with a nice blast of licorice, black cherry and oak in the finish.